If you’re already sweating and sighing in the heat, we can understand. With hectic days, chaotic traffic and little respite from summer, a cold, sweet bite is a heavenly idea. So for your next sugar craving, choose a dessert a little more exotic, topped with wholesome goodness and definitely one that makes a pretty picture for the Instagram feed. 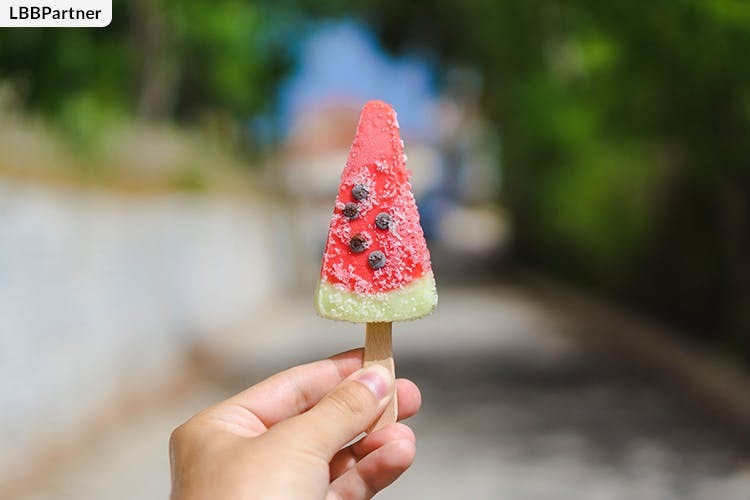 With new cafes and kiosks springing up all over the city, it’s time to move away from the regular flavoured ice lollies and trying something new. Let your tastebuds get the sweet kick of yummy popsicles and choose from salted caramel, apple cider beer, blueberry cheesecake and nutella popsicles among others. From home-delivery to market hopping, this is the perfect option to bear summer easily. Is any summer complete without a scoop of ice-cream? Who are we kidding, we’d eat a tub if we could. So whether it’s a cheat day or you’re looking for a healthy indulgence, try everything from fruit based ice-creams, artisanal sorbets, seasonal variants and creamy bars that are super delish and utterly satisfying. Be a bit different and try Old Monk and Cheese Popcorn, Espresso and Cashew Nut or check our list to sin without guilt. Can’t get enough of chocolate in any form? Get the best of it with Oreo cupcakes or with chocolate churros, and wash it down with a chocolate infused cold coffee. If you’re looking for more than a bite, why not try a freakshake topped with chocolate, sprinkles, pretzels, biscuits or have one straight from a Nutella jar? That’s right, there’s more than one solution for a chocolate craving, so go and get your favourite from around the city. Was Christina Perri singing about desserts in a jar when she sang this song? An old favourite of ours, we loves jars because they allow us to laze around in pajamas and eat straight from a bottle. Did we mention you can try delicious flavours including peanut butter and chocolate, red velvet cake or a vanilla-chocolate? If you’re looking to add some kick in it, try the Jack Daniels Chocolate Ganache, tres leches with Malibu rum or Corona lime cream cheese. Wondering where? See your options here. Drooling a little already but unsure of trying out your favourite out of these? We know tooth sensitivity can hinder a fun day out with these sweet goodies, and if you experience short sharp sensations when biting into cold or sugary treats, then it’s time for a quick check-up. Sensodyne check up is an initiative to spread awareness about tooth sensitivity. Get back on track at a Sensodyne Check Up booth at various outlets of Star Bazaar, Hypercity and Big Bazaar in Mumbai, or online here.